Nashville’s November real estate sales were 7 percent less than November 2017, the Greater Nashville Realtors reports using statistics provided by Realtracs. Year-to-date sales for 2018, 36,633, are off by a much smaller margin – 1.6 percent – from last year’s record-breaking 37,236 for the same period. Of interest, however, is there were 3,076 homes under contract at the end of November compared to 2,906 at the end of last November. That means 2018 could actually break last year’s sales record, despite many Realtors believing it to be a sluggish year. And 2017, as you might recall, surpassed the previous record set in 2006. Sher Powers, the outgoing president of the Greater Nashville Realtors, noted inventory is 25 percent higher compared to last year, which also signals more potential sales ahead. Inventory was at 8,332 at the end of November compared to 7,500 in mid-year. As the city changes and grows, many traditions and trends are fading. For example, sales have remained strong through the winter months during the past few years, which is contrary to previous trends. Normally, there are fewer houses entering the market this time of year, with many homeowners not wanting to show their homes over the holidays. New construction is often slowed by weather. With sales constant and inventory dwindling, sellers willing to squeeze showings in around family holiday gatherings normally have the upper hand. That advantage is lost in spring or fall. Powers, by the way, had a remarkable run as GNR president and was able to see her initiatives to fruition in the areas of affordable housing and the all-important legislative affairs. Powers will be succeeded by Andrew Terrell who was inducted last week. The Realtors are confident that Terrell will carry Powers’ momentum into the next year. There is one segment of the local real estate market that seems to be taking a hit, and that’s a good thing – for numerous reasons. The amount of money developers have paid for houses to demolish over the past few years was often more than the houses were worth. They would purchase the home, bulldoze it and replace with one, two, three or maybe even four houses that bear no resemblance to the former structure they replaced. 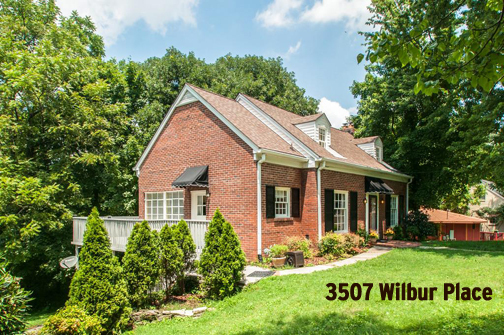 Real estate veterans Chandler Whitley and Kortney Wilson teamed to list the home at 3507 Wilbur Place for $475,000, a price that should have had the developers and builders revving their bulldozers. But the tear-down market can turn quickly, and it apparently has. That’s a fortunate shift for buyers who can only afford homes in the teardown price range. The house on Wilbur is a good example. With three bedrooms, one full bath, a half bath and 2,230 square feet situated on a third of an acre in the Green Hills/Lipscomb area, the $390,000 price is one of the lowest within blocks. During the boom of the past six years, speculators would have devoured the lot at $475,000 – no inspection, no appraisal – and would have allowed the owner to strip the house of anything with any value to retain or sell. To make matter worse, they pay more than the house is worth to a buyer, and most buyers intending to live in such houses need appraisals. This amalgamation of conditions spelled doom for buyers. But like a Florida shower, the teardown buyers, at least for the home at 3507 Wilbur Place, have vanished. Wilson and Whitley seemed to have nailed the price at $475,000, and there were comparable sales galore to support that price. Singer/songwriter-turned-Realtor Mark Nash was there for his buyers. A 22-year veteran of the music business and the founding member of the wildly popular rock group The Good Wolves, Nash made the jump into real estate five years ago, and his timing was brilliant. As is often the case in Nashville, there are musical ties. The legendary Jim Photoglo, a successful singer/songwriter in his own right, owned the house from 1986 to 1992. Photoglo has penned several No. 1 songs, including “Fishing in the Dark” for the Nitty Gritty Dirt Band. Many of Photoglo’s songs were recorded by artists identifiable by one name with no need for surnames, including Garth, Faith, Tanya and Dusty. Nash is with Parks, and Wilson and Whitley hail from Village, both firms are havens of creativity and that bond graced this sale. Nash’s work with The Good Wolves is available wherever music is sold, and both he and the Village People are eager to serve in the real estate world. Richard Courtney is a licensed real estate agent with Fridrich and Clark Realty. richard@richardcourtney.com.